2018 had started with an inflation rate of 25% per annum and falling, but ended with an increase in prices of around 47%. The level of public debt was equivalent at the beginning of the year to 57% of the Gross Domestic Product (GDP) but ends with a level of 95% of GDP. 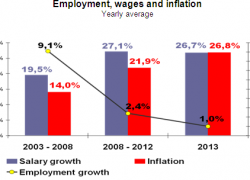 The steep rise in interest rates paralyzes investment and production with a very negative impact on formal employment. The official diagnosis emphasizes the bad harvest of 2018 and the unfavorable conditions in the international financial markets as the main factors causing this frustrating performance. Among the majority of the opposition, the attribution is to the errors of the government. An alternative approach is to investigate if this recessive, inflationary and high public indebtedness scenario is due to circumstantial factors or, on the contrary, responds to more structural causes. 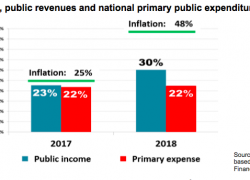 Between 1961 and 2002, 42 years went by, all of which were of fiscal deficits and the genuine income of the federal state only financed 80% of the expenditure. Between 2003 and 2008, they were the only of fiscal surplus years in which the state’s income exceeded public spending by an average of 5%. 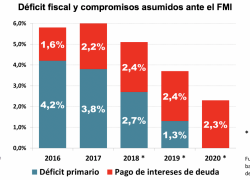 Between 2009 and 2018, another 10 years passed, all of which returned to be of fiscal deficit and the federal state’s revenues barely financed 90% of public spending. These data show that in the last 58 years there were 52 with fiscal deficit. The only surplus years recorded between 2003 and 2008 respond more to accounting tricks than to genuine fiscal solvency. 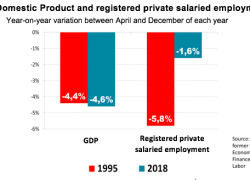 In this period, the expenses were artificially reduced because external debt was not being paid for the 2002 mega-default and public pensions and salaries were reduced in real terms with the rebirth of the inflation. If the legal actions carried on by international creditors and local pensioners had been registered in the public accounts, those years would also have been of fiscal deficits. This leads to affirm that more than half a century of systematic fiscal deficits have been accumulated during which only 85% of public spending was financed with genuine resources, on average. How else can a structural and permanent fiscal deficit be financed if it is not with monetary printing and/or public indebtedness? Given that there are no alternatives, the foreseeable consequences are high inflation and excess of indebtedness that leads to default. The current crisis fits within this logic. Therefore, it is wrong to base the explanations on circumstantial facts such as the drought, the international context or the bad strategies taken by the federal government. As long as the public sector is structurally in deficit, there is no possibility of undertaking economic and social development. The external constraint –that is, the inability of the export sector to generate sufficient foreign currency to finance a sustained process of growth– is a derivation of fiscal disorder. Argentina has a competitive productive sector, but its possibilities of exporting and generating foreign currency are severed by a degraded public sector that put the burden of distorting taxes, insufficient infrastructure, little support for research and development, high interest rates, high inflation and long-term uncertainty. In other words, to overcome the external restriction, the public sector must be ordered. Inflationary monetary printing and unsustainable indebtedness can be avoided through fiscal balance. Thus, conditions to dismantle the anti-export policies that destroy competitiveness in the productive sectors can be generated. For this to happen, the political debate should be less focused on circumstantial facts and more on the approach needed to tackle, with professionalism, the structurally public sector imbalances. different social areas since 2004. Find out what other things we do at IDESA.